The more projects we complete as a team, the more evident it becomes that there will always be more to a gym than just the equipment in it! 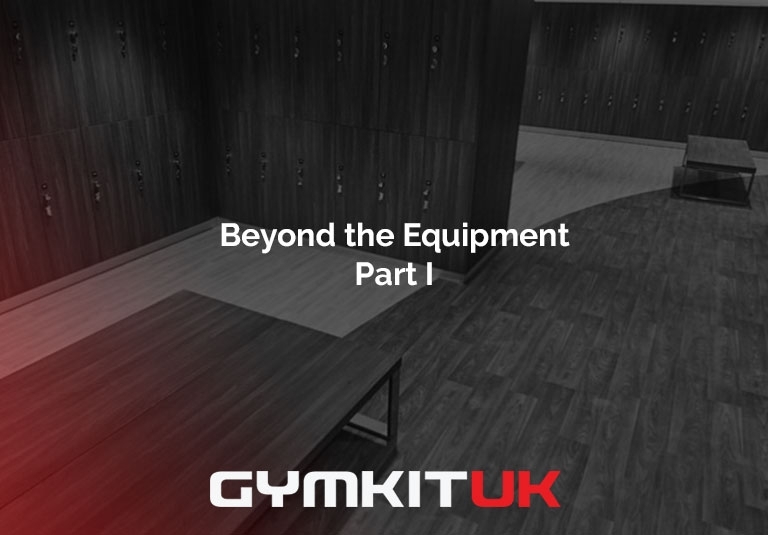 Beyond the equipment will explore the other factors impacting your health club from Solutions by Gymkit UK. There are many different types of people who go to the gym, from fitness fanatics to first timers, each with individual expectations of how a gym should be. There is no right or wrong dream gym but there are some constants. Nailing the below will ensure no complaints from members on their journey from the front door to their workout. As a gym owner, you can really have some fun here. From the moment someone enters your gym you have the opportunity to set the pace for their visit. Lighting, music and the layout can be the difference between your health club psyching people up or making their visit feel like a chore. A stunning reception counter manned by energetic and eager staff will ensure people are motivated to start their workout. The atmosphere doesn't start and stop in the workout areas. Consider your reception, changing rooms and other breakout areas. Be sure to match the lighting, music, design and feel to the purpose of the room. Studios especially can be a haven for exciting floors, bespoke equipment and imaginative design. There is no point in having the best shower facilities and stunning lockers if the overall hygiene factors within your health club are not up to scratch. There is no excuse when it comes to gym hygiene. Poor attention to detail here will directly impact member retention. Be sure your cleaning team are working from top to bottom, drains to locker interiors, treadmill belts to free-weight shelves. Even the best interiors on the planet lose all power when not properly maintained. Visible boards that show your members how regularly your facilities are being cleaned is a great way to show your commitment to keeping them safe and healthy. It goes without saying that people are at their most sweaty when working out. Ensure your clients also do their part to keep hygiene levels up. Enforce a policy of wiping down machines, provide paper towels and ask that changing rooms be left as found. Once upon a time lockers were a luxury. An additional extra where members might be expected to bring their own padlock if they wanted to use. Nowadays technology and expectations have moved on. Lockers are an essential part of a user being able to feel safe within a facility. It becomes their base in your gym. It should be part of the integrated experience with easy access, adequate space and careful planning to ensure your locker is not floating miles away from where you are getting changed. Simply offering a locker is not enough anymore. It must be considered as part of the users expirence. Lockers can also look incredible now with designs to match even the most ambitious of ideas. Shower cubicles can divide opinion. At Gymkit UK we install everything from completely private screens to open area showers. It has always depended not on the client's requirements, but the requirement of the clientele they are looking to attract. Not all users will feel comfortable in an open plan shower area & it's rare not to see cubicles these days. Bare in mind convenience for your visitors. Towel hooks make a great addition to ensure an easy user experience. A well-planned shower cubicle area also means space for your users without compromising on the number of cubicles. Be sure to think about these as a wider part of the changing room expirence. Part 2 of our beyond the equipment series will be coming soon. We will further be exploring the impact a well design gym can have on your members experience beyond the equipment you provide including services and some more bespoke equipment to make the most of your space.